Commemorative Czechoslovakia stamps first appeared in 1920, two years after their independence from the Austro-Hungarian Empire. Where the extensive pictorial definitive stamps of Czechoslovakia usually feature famous Czechoslovakian leaders, castles, and landmarks, the early commemorative stamps of Czechoslovakia often celebrate historical events, celebrations, or significant anniversaries. After about 1928, the number of commemorative Czechoslovakia stamps increased significantly. After all, with over 2,000 years of history around them, finding important historical events to commemorate is an easy task! The three commemorative Czechoslovakia stamps shown above were issued on March 7, 1920 to celebrate the 70th Anniversary of the Birth of President Thomas Masaryk. The three stamps (Sc. #61-63) feature a contemporary portrait of the Czechoslovakian leader. Imperforate examples of these stamps exist, but they were not regularly issued in that form. Thomas Garrigue Masaryk (1850-1937) was a politician, sociologist, and philosopher. An advocate for Czechoslovak independence before and during World War I, Masaryk became the founder and first president of the Republic of Czechoslovakia. 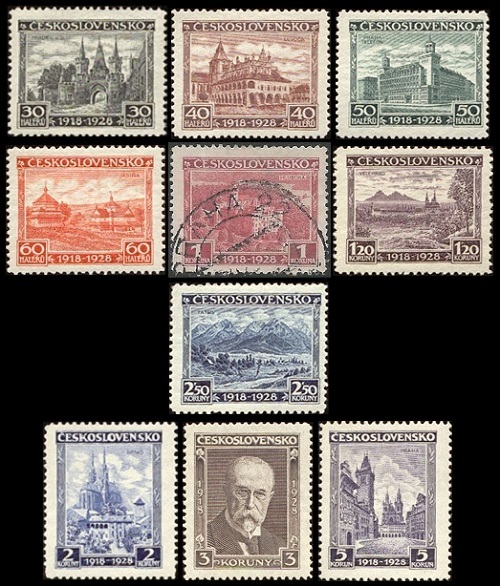 The ten commemorative Czechoslovakia stamps shown above were issued on October 22, 1928 to celebrate the 10th Anniversary of the Republic of Czechoslovakia. These stamps (Sc. #142-151) are inscribed 1918-1928, and they feature the following designs. 30 H. - Hradec Castle (Bohemia). The castle was built as a private residence at the end of the 15th Century. Today, it houses the Czech Silver Museum. 40 H. - Levoca Town Hall (Slovakia). The town hall was built between the 15th and 17th Centuries, and it now houses a museum. 50 H. - Prague Telephone Exchange (Bohemia). The International Telephone and Telegraph Exchange opened on June 19, 1927. 60 H. - Town of Jasina (Carpathia). Originally a town in the Kingdom of Hungary, it was part of Czechoslovakia from 1920 to 1938, again part of Hungary from 1939-1944, and part of the Ukrainian Soviet Socialist Republic from 1945 to 1991. 1.00 K. - Hluboka Castle (Bohemia). Originally built, as a Gothic castle in the 13th Century, it was rebuilt, as a Baroque castle, during the 18th and 19th Centurys. The last private owner left in 1947, and today, it is a national cultural monument of the Czech Republic. 1.20 K. - Pilgrims' House in Velehrad (Moravia). The Velehrad Monastery and its medieval Basilica of St. Cyril and St. Methodius is one of the most important pilgrimage spots in the Czech Republic. St. Cyril and St. Methodius were 9th Century Byzantine missionaries that brought Christianity to the Slavs of Great Moravia. 2.00 K. - Brno Cathedral (Moravia). The Cathedral of Saints Peter and Paul, in Brno, is a national cultural monument. The Baroque cathedral was begun in the 14th Century, on the site of a former Gothic basilica. 2.50 K. - Tatra Mountains (Slovakia). The Tatra Mountains form a natural border between Slovakia and Poland. 3.00 K. - President Thomas Masaryk. Thomas Masaryk was the President of Czechoslovakia from 1918 to 1935. 5.00 K. - Old City Square in Prague (Bohemia). The historic square in the Old Town of Prague is dominated by the 14th Century Gothic Church of Our Lady before Tyn, and it is the site of the execution of Jan Hus. 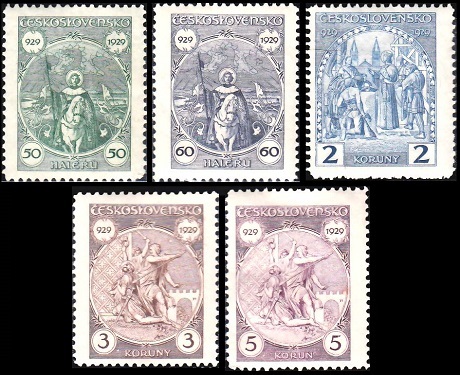 The five commemorative Czechoslovakia stamps shown above were issued on May 14, 1929 to celebrate the 1,000th Anniversary of the Death of St. Wenceslas. These five stamps (Sc. #159-163) feature the following designs. 50 H. - St. Wenceslas. 60 H. - St. Wenceslas. 02 K. - Founding of Vitus Cathedral. 03 K. - St. Wenceslas Martyred. 05 K. - St. Wenceslas Martyred. Wenceslas I or Vaclav the Good (907-935) was the Duke of Bohemia from 931 to 935. He was assassinated as the result of a plot by his brother, Boleslav the Cruel. He had a reputation for heroic goodness, which resulted in his posthumously being elevated to sainthood and given the title of "King". He is the subject of the 1853 Christmas carol "Good King Wenceslas". Wenceslas I should not be confused with King Wenceslas I of Bohemia (1205-1253), who ruled Bohemia from 1230 to 1253. 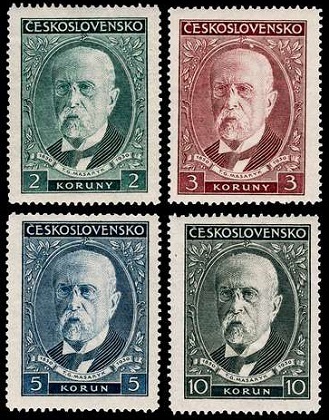 The four commemorative Czechoslovakia stamps shown above were issued on March 1, 1930 to celebrate the 80th Anniversary of the Birth of President Thomas Masaryk. The four stamps (Sc. #175-178) feature a contemporary portrait of Thomas Masaryk. 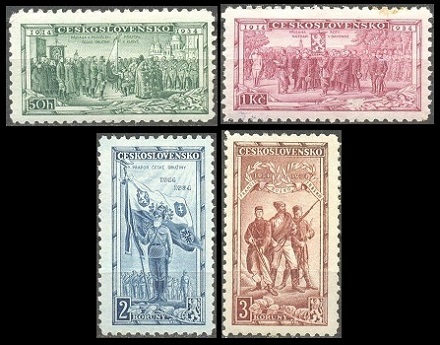 The four commemorative Czechoslovakia stamps shown above, in the top row (Sc. #187-90), were issued on March 16, 1932 to celebrate the 100th Anniversary of the Birth of Miroslav Tyrs and the 9th Sokol Congress, held in Prague. The 60 H. denomination stamp shown above, in the bottom row (Sc. #191), was issued as a definitive stamp on February 1, 1933. It is very similar to the two lower denomination designs of the 1932 stamps, only without the ribbon and dates. Miroslav Tyrs (1832-1884) was a Czech art historian and sports organizer. Being in bad physical health himself, he developed an interest in sports. He became the co-founder of the Sokol (Gymnastics) Movement in 1862. 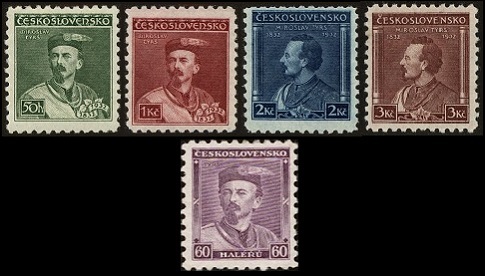 The four commemorative Czechoslovakia stamps shown above were issued on August 15, 1934 to celebrate the 20th Anniversary of the Czechoslovakian Legion. These four stamps (Sc. #195-198) feature the following designs. 50 H. - Consecration of legion colors at Kiev. 01 K. - Legion receiving battle flag at Bayonne. 02 K. - Ensign Heyduk with colors. The Czechoslovak Legion was a volunteer force, made up of Czechs and Slovaks, that fought with the Entente Powers during World War I. Their goal was to win the Allies' support for the independence of Bohemia and Moravia from the Austrian Empire and of Slovakia from the Kingdom of Hungary. Originally an all-volunteer force, these groups were later strengthened by Czech and Slovak prisoners of war and by deserters from the Austro-Hungarian Army. By the end of the war, the legionnaires numbered in the tens of thousands. The two commemorative Czechoslovakia stamps shown above were issued on December 17, 1934 to celebrate the 100th Anniversary of the National Anthem. The common design of the two stamps (Sc. #200-201), which are perforated 10, features a pastoral scene. There are also two very large souvenir sheets (Sc. 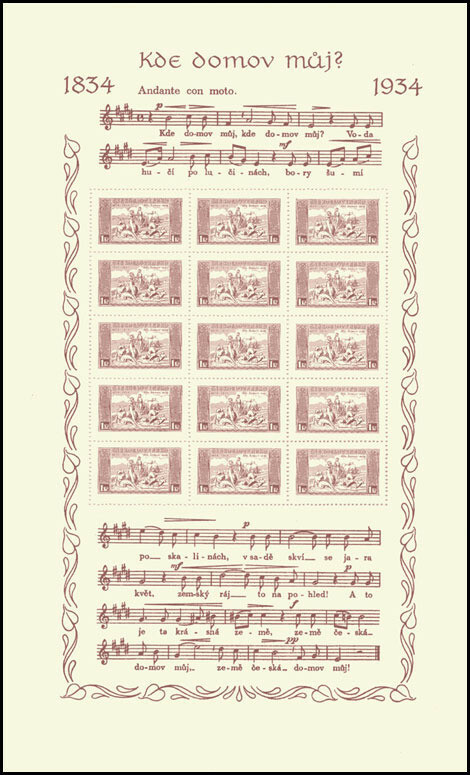 #200a-201a), shown above, with part of the musical score and 15 stamps that are perforated 13 1/2. These souvenir sheets are scarce and very expensive. The two commemorative Czechoslovakia stamps (Sc. #192-193) shown above were issued on June 20, 1933 to celebrate the 1,100th Anniversary of Prince Prbina and the establishment of the first Christian church in Slovakia. The two stamps feature different views of Castle Hill in Nitra, Slovakia. It is believed that the 11th Century Nitra Castle was built either on or near the site of the 9th Century church built by Prince Prbina. Prince Prbina (800-861) was an adventurous Slavic prince. He was the Prince of Nitra c. 833 and the Prince of Pannonia from 836 to 861. Prince Prbina was the first ruler of Slavic origin to accept Baptism, and he was the first ruler to build a church on Slavic territory, with that being in Nitra. The 50 H. denomination Czechoslovakia stamp (Sc. 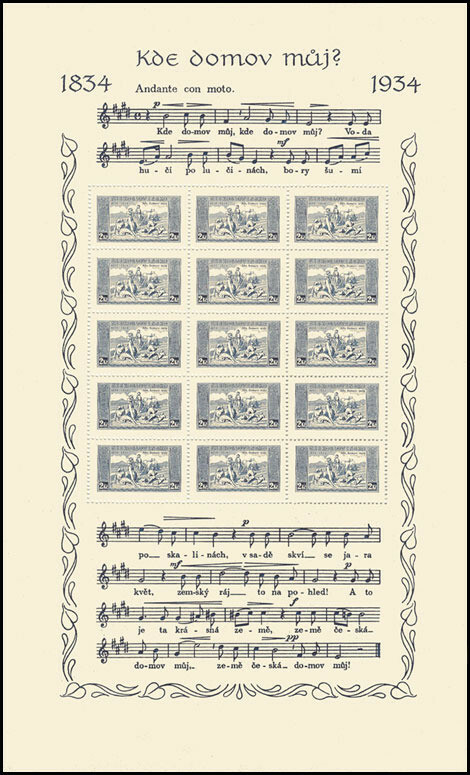 #194) shown above was issued on March 26, 1934 to commemorate the 50th Anniversary of the Death of Bedrich Smetana. Bedrich Smetana (1824-1884) was a Czech composer. He is regarded as the father of Czech music, as his composition style was closely identified with his country's struggle for independence. The 50 H. denomination Czechoslovakia stamp (Sc. #199) shown above was issued on November 22, 1934 to commemorate the 30th Anniversary of the Death of Antonin Dvorak. Antonin Dvorak (1841-1904) was a Czech composer. Along with Bedrich Smetana, he was one of only two Czech composers of their time that succeeded in achieving Worldwide fame. From 1892 to 1895, Dvorak worked in the United States. His goal was to discover an American style of music. He did this by combining elements of the music of Native Americans and African Americans to form a style that was uniquely American. In 1893, the New York Philharmonic commissioned Dvorak to compose his very famous "Symphony No. 9", also known as the "New World Symphony". Within a couple months of its publication, the new New World Symphony was being performed by orchestras around the World.